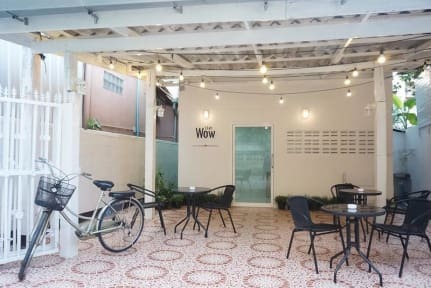 Featuring a terrace, Stay Wow Home is situated in Chiang Mai, 400 m from Nong Buak Hard Public Park. Located around 600 m from Chiang Mai Gate, the guest house is also 700 m away from Chedi Luang Temple. A tour desk can provide information on the area. All rooms at the guest house come with a seating area. Featuring a shared bathroom, rooms at Stay Wow Home also boast a city view. The rooms at the accommodation include air conditioning and a desk. Wat Phra Singh is 800 m from Stay Wow Home, while Suan Dok Gate is a 12-minute walk from the property. Chiang Mai International Airport is 2 km away. This is our guests' favourite part of Chiang Mai, according to independent reviews.This property also has one of the best-rated locations in Chiang Mai! Guests are happier about it compared to other properties in the area. 5. No Smoking in bedroom. We has Smoking area at the terrace. 6. Age restriction: not allow for kid (1 - 10 years old).